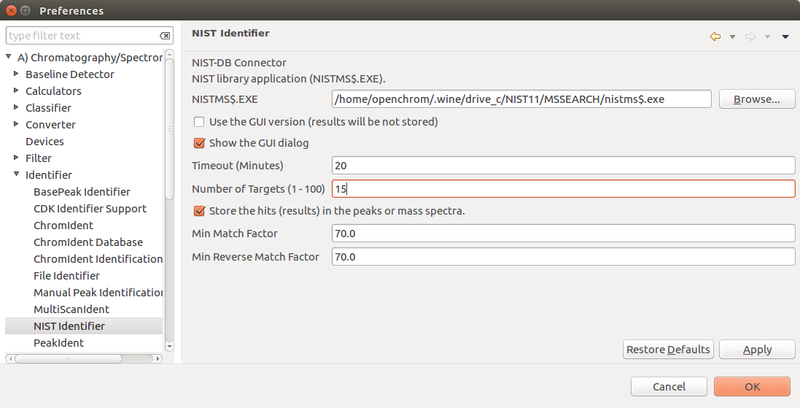 Linux users: It’s possible to install the NIST-DB under Linux using WineHQ. First of all, install the database and run it. It may happen that a dialog is shown at first start. Please select the checkbox that it won’t be shown again. If everything works fine, the NIST-DB UI will be opened. Please select the database(s) that shall be used. Other settings can be edited too. They will be used when running an automated search, e.g. 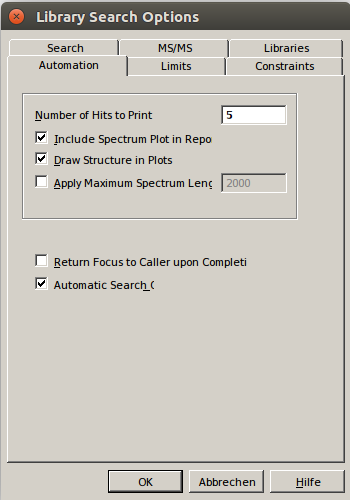 modify the setting “Number of Hits to Print“. Close the NIST database. It is necessary that the NIST-DB is closed when running an automated search. 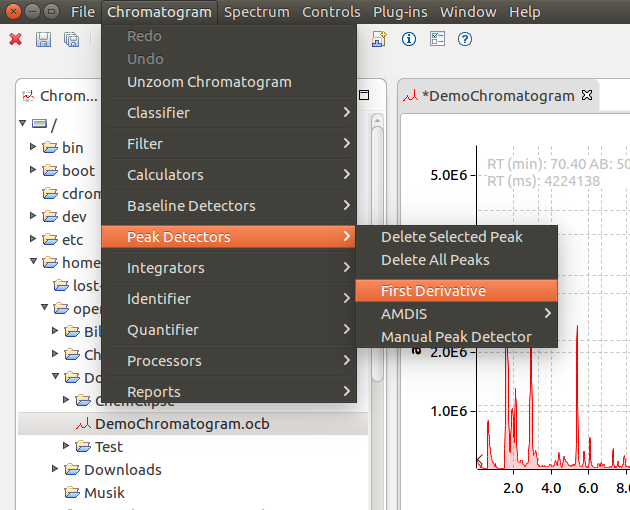 Please start OpenChrom, load a chromatogram and modify the peak detector settings (Menu > Window > Preferences > Chromatography/Spectrometry > Peak Detector > First Derivative Peak Detector). Run the “First Derivative” peak detector (Menu > Chromatogram > Peak Detectors > First Derivative). 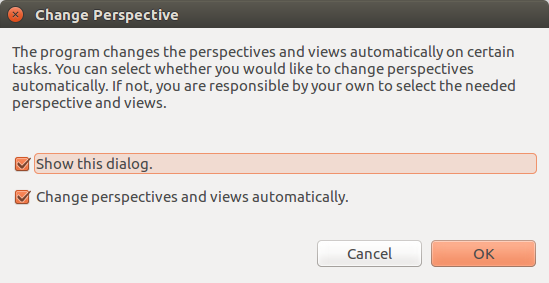 A dialog appears to inform you that perspectives and views are switched automatically. 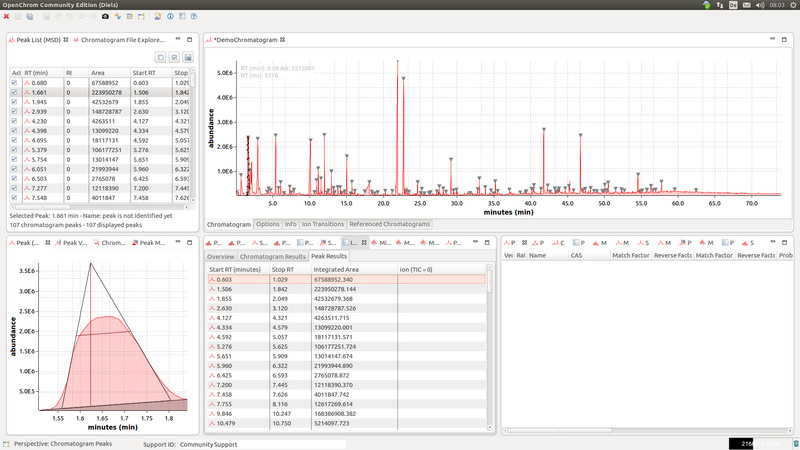 OpenChrom selects the best perspective and views for your to display the data in an optimal way. Please disable the checkbox if you don’t like OpenChrom to do this for you. After peak detection, the “Chromatogram Peaks” perspective is shown. 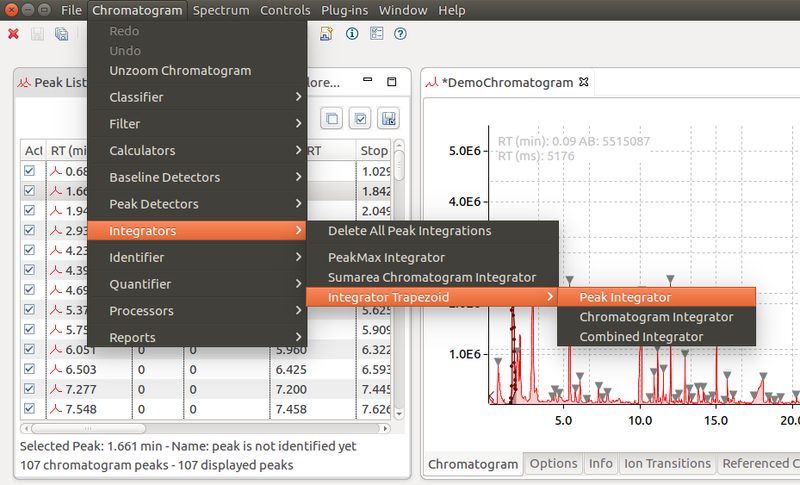 Afterwards, run the peak integrator (Menu > Chromatogram > Integrators > Integrator Trapezoid > Peak Integrator). 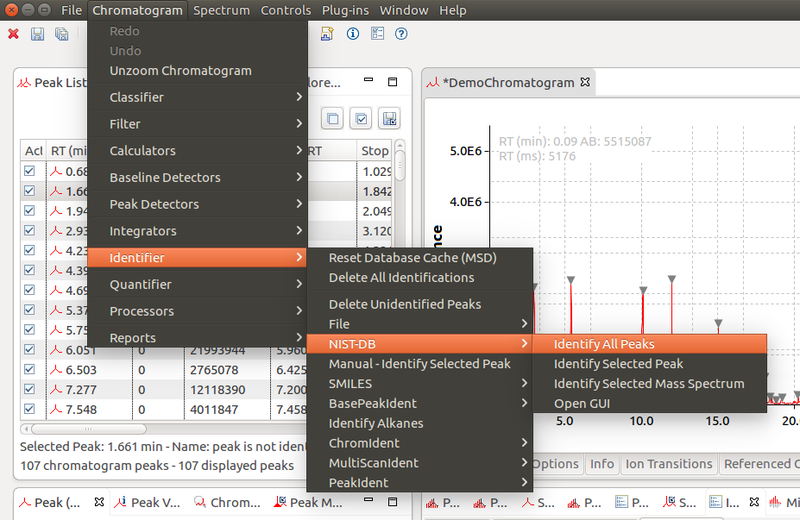 Peak detection and integration are separated in OpenChrom. This offers a greater flexibility to analyze chromatograms. 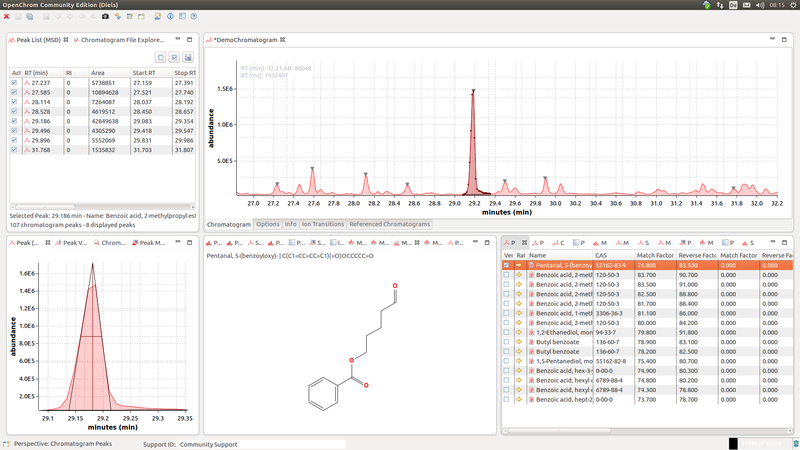 All detected peaks are marked with an inverse triangle in the chromatogram editor. 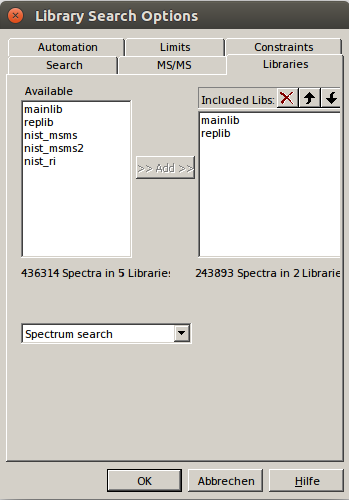 Then edit the NIST-DB settings (Menu > Window > Preferences > Chromatography/Spectrometry > Identifier > NIST Identifier). Select the nistms$.exe, set how many results (targets) you’d like to see as well as the min match factor settings. 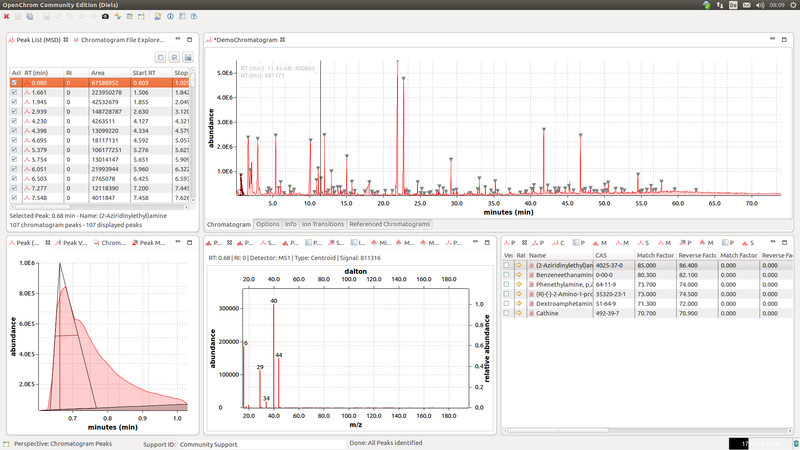 Now run the peak identification using the NIST-DB (Menu > Chromatogram > Identifier > NIST-DB > Idnetify All Peaks). This operation could take a while. 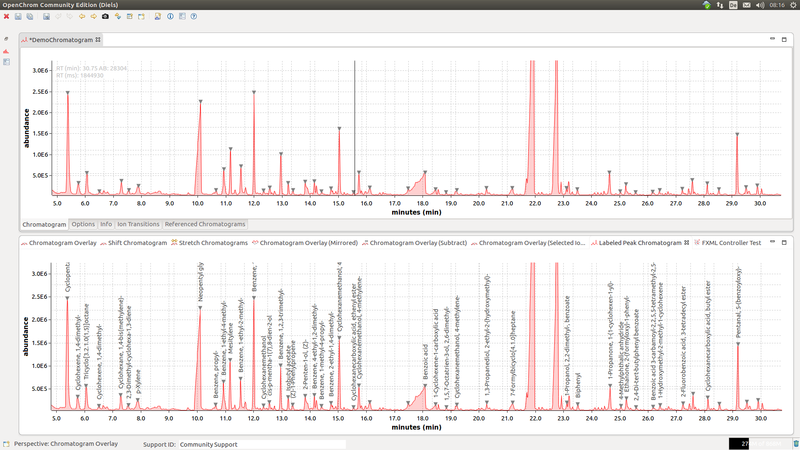 OpenChrom waits until the NIST database has identified all peaks. After the list of peaks has been identified successfully, the results for each peak are displayed in the “Peak Targets (MSD)” view. This displays the information which has been retrieved from the NIST database. SMILES formulas can be generated too now (Menu > Chromatogram > Identifier > SMILES > Calculate SMILES). Sometimes, it’s not possible to generate a SMILES formula. It’s also possible to delete all identifications without a SMILES formula (Menu > Chromatogram > Identifier > SMILES > Delete Identifications without SMILES). 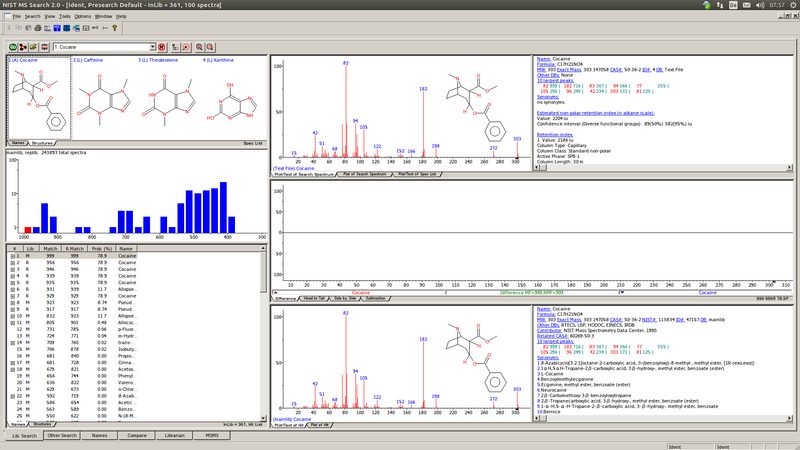 OpenChrom allows to generate a display of the molecule dynamically. Please select the “Molecule” view. The checkbox enables to manually verify a peak target even if it has a lower match factor than the other results. The best identification is plotted on top of the peak in the “Labeled Peak Chromatogram” view. Please select the “Chromatogram Overlay” perspective. Use the *.ocb file format to save “Save As…” the chromatogram, peaks and identification results. 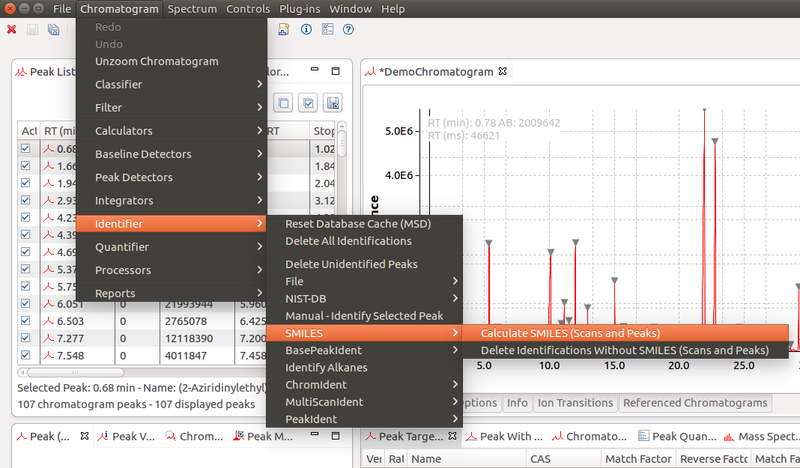 Please also have a look at the chromatogram report options (Menu > Chromatogram > Reports > OpenChrom Report).